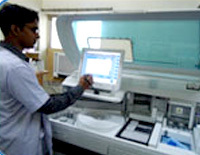 Fully computerized Biochemistry, Microbiology, Clinical Pathology & Hematology, Histopathology & Serology units. Can run more than 2000 tests round the clock. With our real – time PCR we can detect the viral load in case of a viral disease with quantification of the infectious agent as well as genotyping which cannot be done by the ordinary PCR method. The Biochemistry Laboratory has a comprehensive test menu of analytes and thus serving the needs of various clinical specialities. 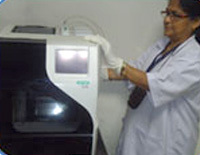 It is a NABL accredited laboratory that has the highest quality standards in patient care. The Biochemistry Laboratory also has a state of art facility which includes high throughput (fast) clinical chemistry autoanalysers, semi automated analysers, Electro Chemiluminescence based Immunoassay analyzer, Electrolyte analysers etc. The laboratory has bidirectionally interfaced equipments providing connectivity with the hospital management system and thus ensuring accurate and quick results. The laboratory participates in External Quality Assurance programmes. Research work is also done in the laboratory on biomarkers in various diseases. Routine Clinical Biochemistry assays done on a high throughput fully automated analyzer. Serum as well as urinary electrolytes done using Ion Selective Electrode Technology. Hormone assays including thyroid hormones, reproductive/fertility hormones, cortisol, insulin, ferritin are done on Cobas e411 Electro chemiluminescence analyzer. Vitamins like Serum B 12 and Folate. Urine chemistry including urinary albumin, protein, as well as 24 hour urinary urea,creatinine etc. Body Fluid (Ascitic / Pleural / Synovial / Cerebro Spinal Fluid) Chemistry. The laboratory has a facility to do a wide spectrum of Tumor Markers like Alpha Feto Protein (AFP), PSA, CA 19.9, CEA and CA 125. Analytes required in Critical care medicine like Lactate, Bicarbonate, and Procalcitonin. HbA1c (Glycosylated Hemoglobin) by HPLC (NGSP certified gold standard technique). Special and rare analytes like Copper and Ceruloplasmin. Microbiology section is under the external quality control program with WHO and is equipped with automated systems involving blood culture, TB culture & susceptibility, bacterial identification and sensitivity (VITEK-2 Compact). Many research activities are in progress in this section with PhD students who have published many research papers in International and National journals. Students from all over the country participate in summer research and training program in this section every year. There are also facilities for diagnosis of many uncommon microbes like Brucella, Leptospira, Clostridium difficile, Leishmania (Kalaazar) etc. 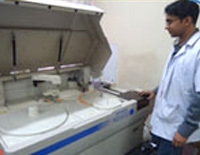 Serology & Immunology section is equipped with most modern equipments like Vitros Immunoassay system, Vidas and so on. There are facilities for immunofluorescence studies for ANA, ds DNA, p ANCA , c ANCA; all hepatitis markers, anti CCP, TORCH etc. This highly advanced department is equipped with extremely rapid molecular detection facilities (GeneXpert) of many deadly infections like tuberculosis; H1N1 influenza etc. This section is also equipped with Real Time PCR Unit for genetic identification and genome quantification of hepatitis viruses in clinical samples. There are biosafety cabinets, deep freeze cabinets, and high speed cold centrifuge in this section. The Laboratory Hematology Department performs a wide variety of basic and advanced hematology testing on whole blood, serum, urine, cerebrospinal fluids and other body fluids.It uses latest generation 7part cell counters and full automated coagulation system. Routine hematology and coagulation testing is available 24 hours a day, 7 days a week. Additionally, advanced hematological tests are a performed using a variety of techniques are available from Monday to saturday 9 am – 6 pm. Routine hematology testing including complete blood count, blood differential, smear morphology and special stains. Routine coagulation testing (PT and PTT),correction studies,Dimer and Fibrinogen. Testing for hemoglobinopathies using HPLC system. Comprehensive Urinalysis and body fluid analysis. Histopathology & Cytopathology deparment is involved with the macroscopic and microscopic examination of tissue samples (biopsy material) to diagnose and evaluate disease. 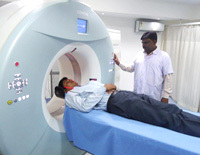 Provides comprehensive services to the Peerless hospital,referrals from Peerless Diagnostics and of cases sent by General and Specialist Practitioners of the city of Kolkata and suburbs. The department deals with approximately 7,000 cases annually. The department comprises of 10 medical, scientific and ancillary staff and has an excellent reputation for clinical and scientific training.